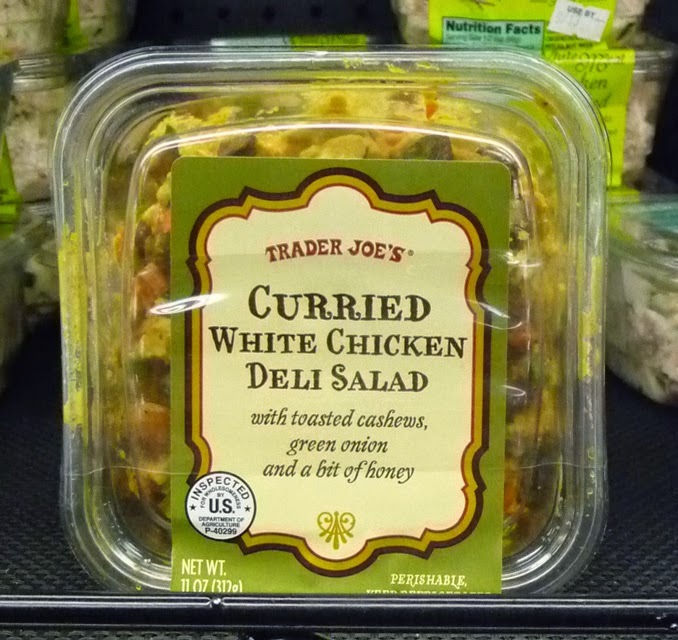 My wife loves Trader Joe's Curried White Deli Chicken Salad, and so do I. She will often chastise me after I finish off the small tub of leftovers she leaves in the refrigerator - hey, it's her own dang fault for not hiding it better! 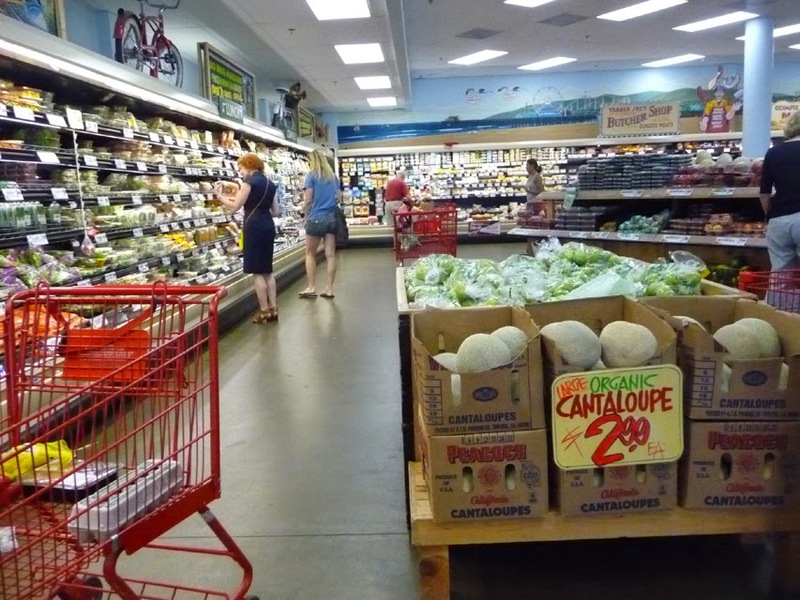 They carry specialized frozen and fresh packaged foods, locally baked bread, organic veggies and fruit, hormone-free meat, chicken and fish, along with a huge selection of exotic beer, wine and spirits. They my be best know for introducing the tasty 2 Buck Chuck line of wine (no longer 2 bucks, but still cheap) that is the favorite beverage of starving artist and actors, served at parties, dorm rooms, and gallery openings. 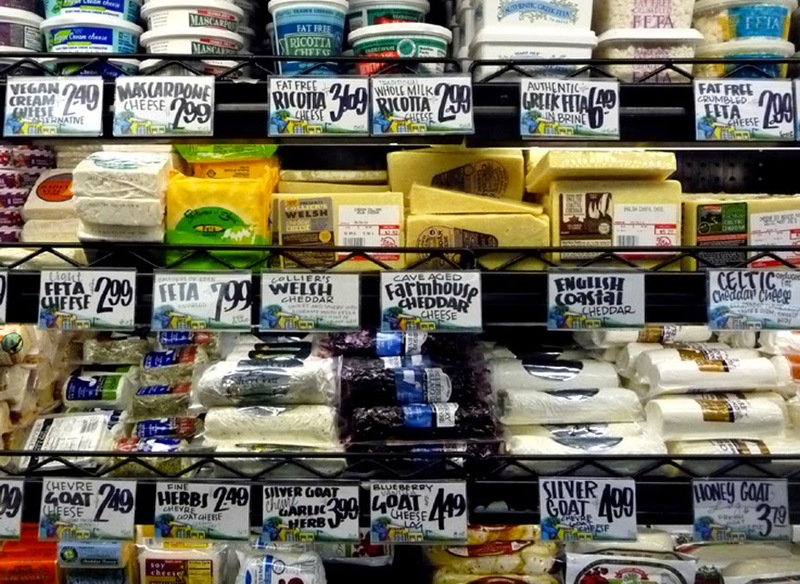 There is even a popular cookbook series devoted to Trader Joe grocery store ingredients (see them here.) Check out below a few stocked items. Well, I picked Trader Joe's recipe lock for my latest cheap$kate treasured bite. What makes Trader Joe's Curried White Chicken Deli Salad so good is the disparate flavorful contents. 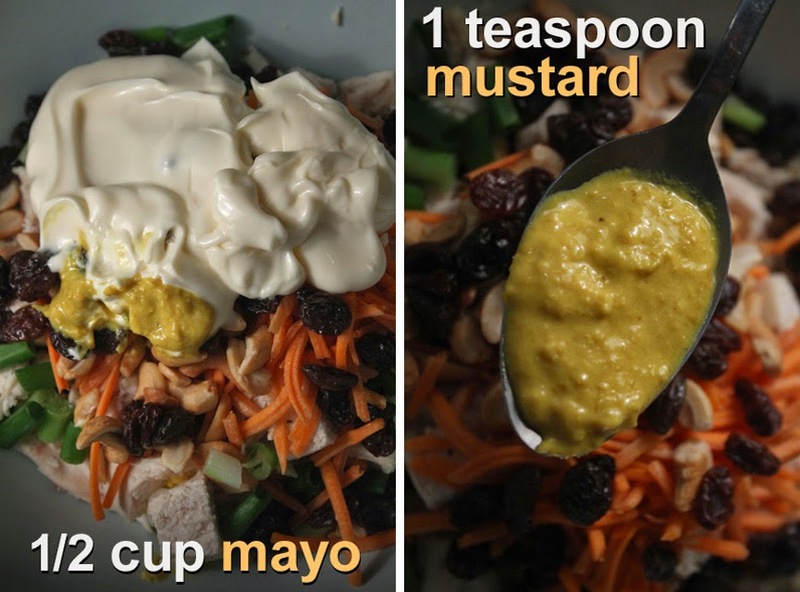 You have green onions and raisins, cashew nuts, garlic powder, lime juice and shredded carrots, with chicken, all in a mayo, mustard, honey and curry sauce. Whew, it shouldn't all work together, but boy does it ever. 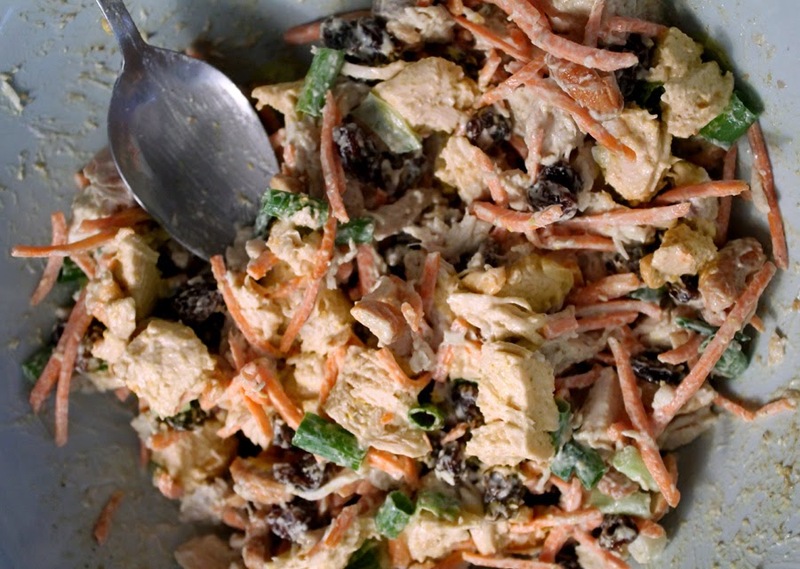 This chicken salad will quickly move up the ladder on you favorites list. It's crunchy with cashews, creamy with mayo, and so flavorful with cumin or curry spice, plus an added sweet touch of honey. 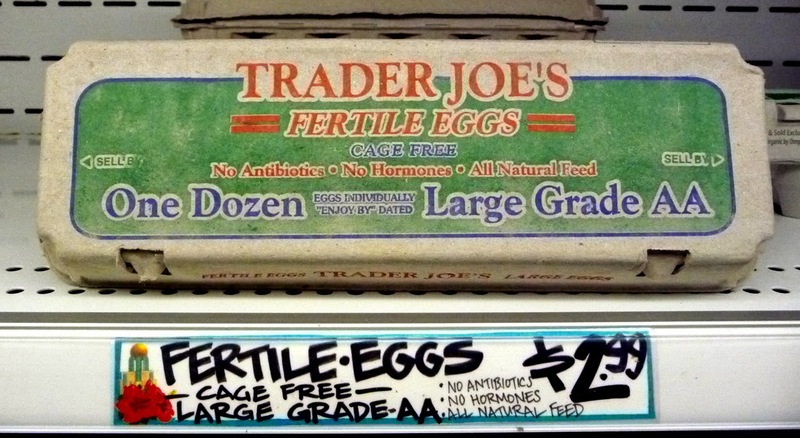 Especially when I can make almost twice as much, for less than the price of Trader Joe's eleven ounces at $3.99! I always find small packages of nuts. This recipe calls for cashews, but regular cooked peanuts are a cheap substitution. If you buy salted nuts, I recommend rinsing off the salt, then allowing them to dry. Too much salt will overwhelm the chicken salad. My Curried White Chicken Deli Salad is not as yellow as Trader Joe's version because turmeric powder is used. While this spice adds another level of flavor, it also adds a yellow tint. But I find the overall taste is close enough to Trader Joe's chicken salad, even without it. If you have turmeric in your spice rack then go ahead and add a teaspoon. I'm not replicating their recipe exactly, I'm more concerned about the overall flavor and using ingredients any of my visitors can find for the right price. 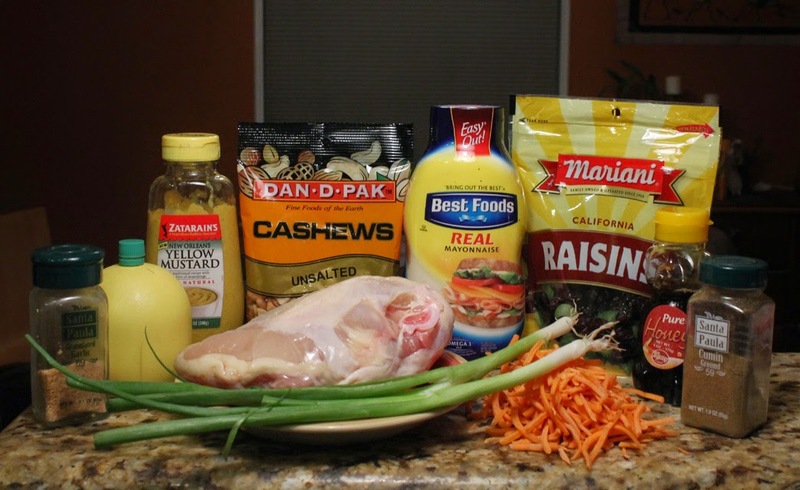 I make this as I would a regular mayo-based chicken or tuna salad, just adding the extra ingredients listed above. The ingredient amounts are the main mystery. Hmmm, I'm just guessing the balance, but I think it's close enough. And you can always adjust any ingredient amount to suit your own taste buds. This recipe is wife approved, so I know everyone will like it. 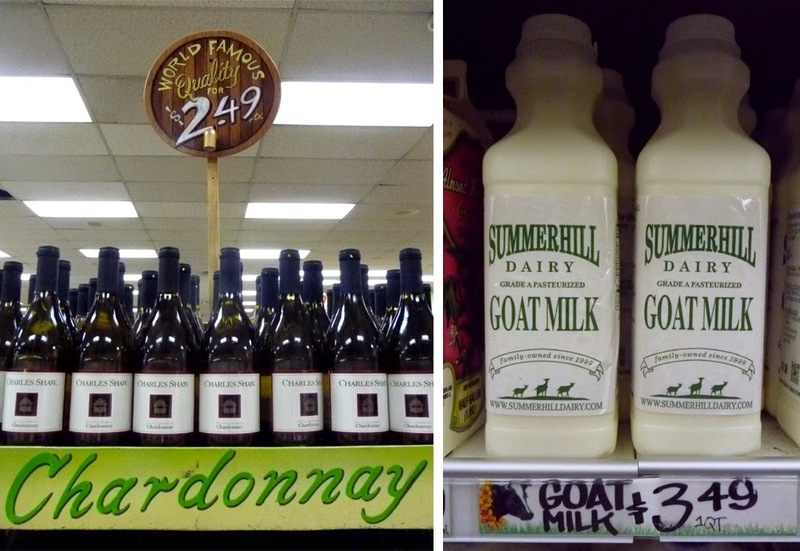 And don't let Trader Joe's know that I ripped off their Curried White Chicken Deli Salad recipe and made it for almost half the price, I don't want to get banned from getting their 2 Buck Chuck Chardonnay! 1 - 1 1/2 pounds chicken breast - I poached a large half-breast. Okay to use roasted chicken from your favorite grocery store. 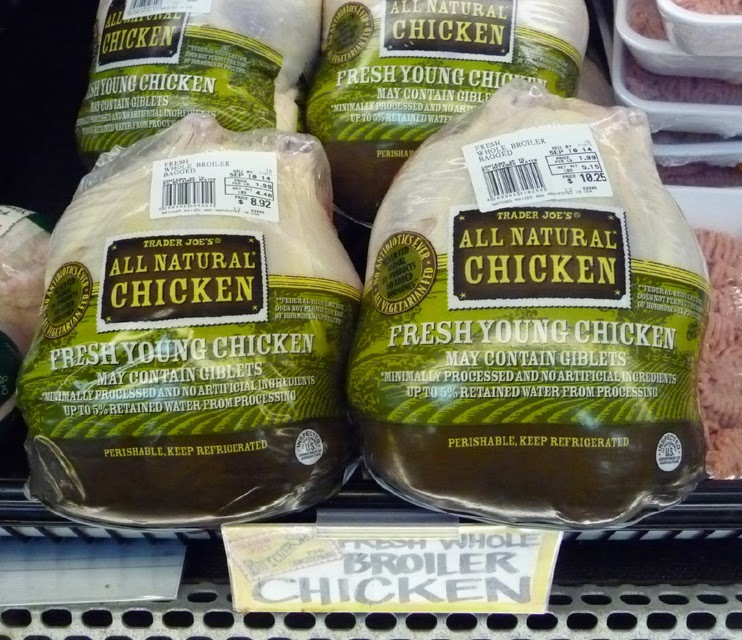 Poaching dark meat chicken is a tasty and cheaper way to go. 1/2 cup roasted cashew nuts - if salted, then rinse them off and allow the nuts to dry. Okay to substitute with cheaper roasted and shelled peanuts. 1 cup of shredded carrot - I used packaged. You can thin "matchstick" slice a carrot, or hand-shred it with a veggie shredder. 1/2 cup of mayo - okay to add more or less for desired creamyness. 1 teaspoon mustard - any type. I used coarse ground mustard. 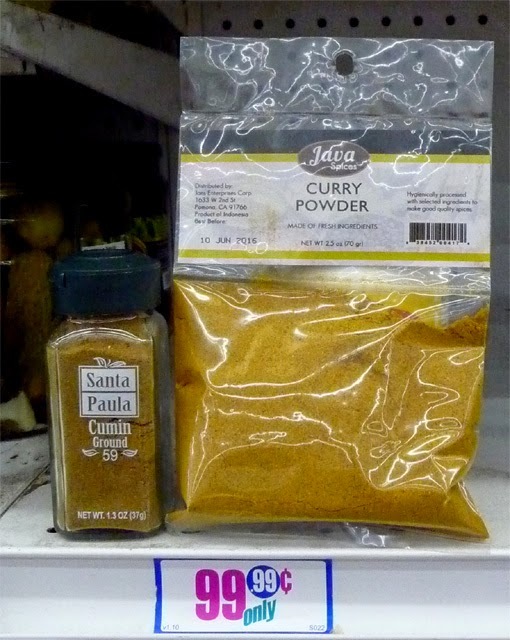 1 tablespoon ground cumin or curry powder - I find ground cumin is the cheap and easy way to go, as it is close enough to regular powdered curry (which can be hard to get.) If you have turmeric then add a teaspoon for color and extra flavor. 1/2 teaspoon garlic powder - or granulated garlic. 1 teaspoon lemon or lime juice - fresh or from a bottle. Roughly chop or shred cooked chicken breast. Total amount should be about 2 cups. 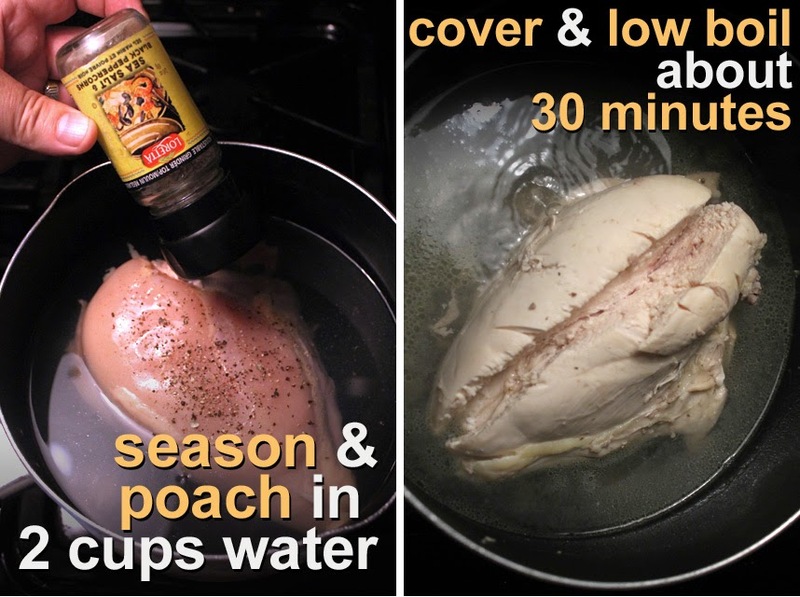 You can use deli store bought roasted chicken, or follow my chicken poaching method below. I bought a large half-breast of raw chicken. I filled a pot of water halfway covering the chicken breast. Season it with salt and pepper (or any favorite spices and aromatic veggies like onion and garlic.) Put a lid on the pot and low boil the breast about 1/2 hour to 45 minutes, depending how large the breast is. You can slice into the thickest part of the chicken breast to make sure it cooks all the way through. While chicken is cooking you can prepare the other ingredients. Chop 2 green onions and shred a carrot, unless you buy shredded carrot in a bag. If roasted cashew nuts are salted, then rinse them off under water then allow them to dry out. 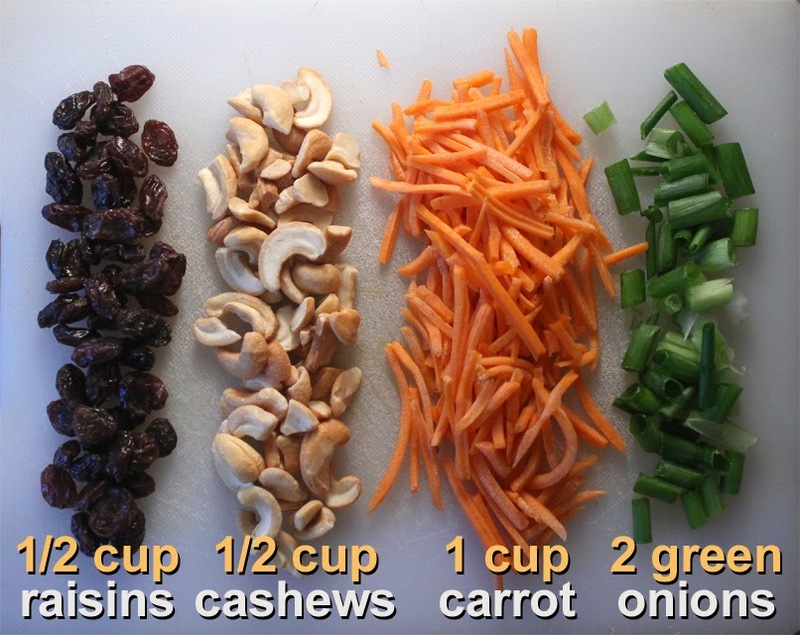 Add into a large bowl the sliced and cubed chicken, along with chopped green onion, raisins and cashews. Sprinkle on the cumin (or curry powder) and garlic powder. Finally drizzle on a teaspoon of lemon or lime juice, and a teaspoon of honey, or a favorite sweetener. Best to refrigerate the Curried White Chicken Deli Salad for a couple of hours, so the spices and other flavors intensify. Store it in the refrigerator until ready to serve. I like this chicken salad served with crackers. You can put it on sandwich bread or in pita bread. Also, try adding a couple scoops to a favorite leafy salad. Again adjust the ingredients to suit your taste. 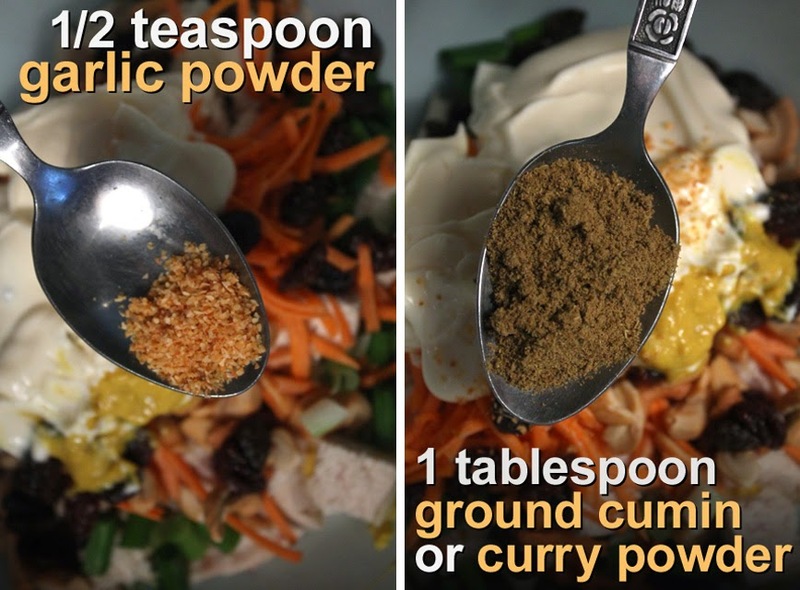 If you want a lighter curry taste then take away some ground cumin, curry, or turmeric powder. Same goes for honey, mayo and mustard. Add a little at a time, then taste. 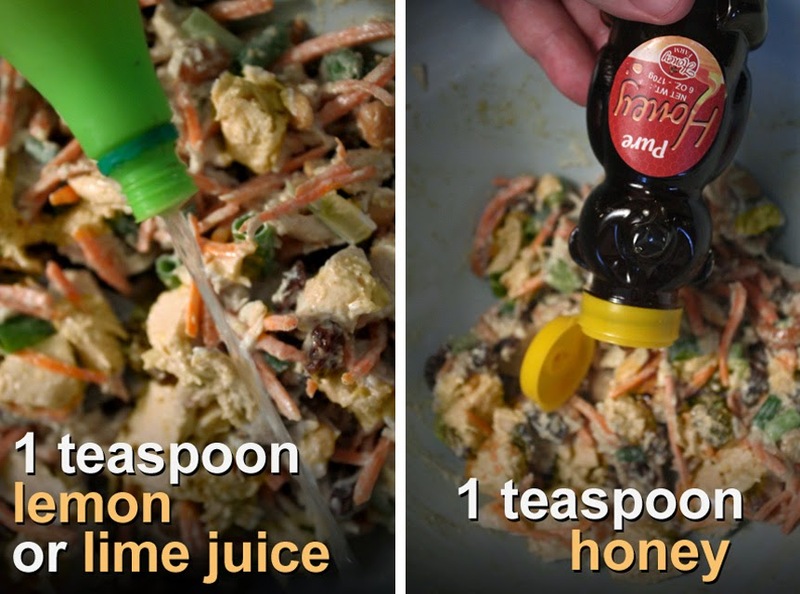 Using less, or no honey, is okay as raisins add a good amount of sweetness. 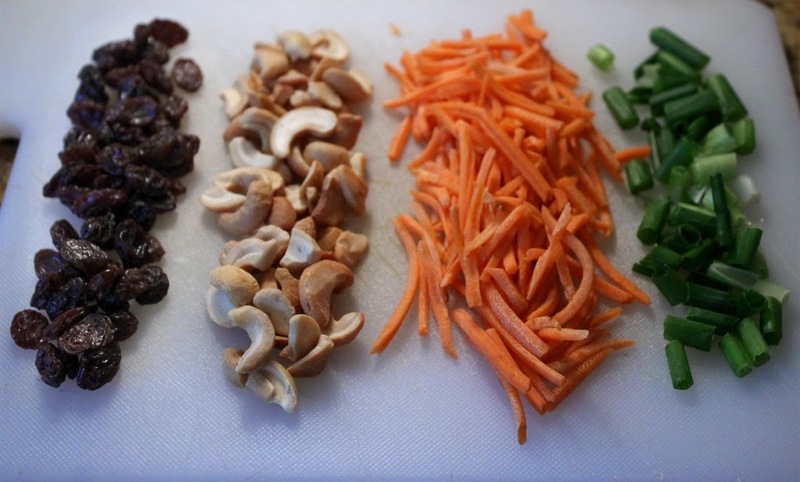 Also stretch it out with more carrot, raisins and green onions - you could even add some celery or apple. If you like a lot of protein then add more chicken. 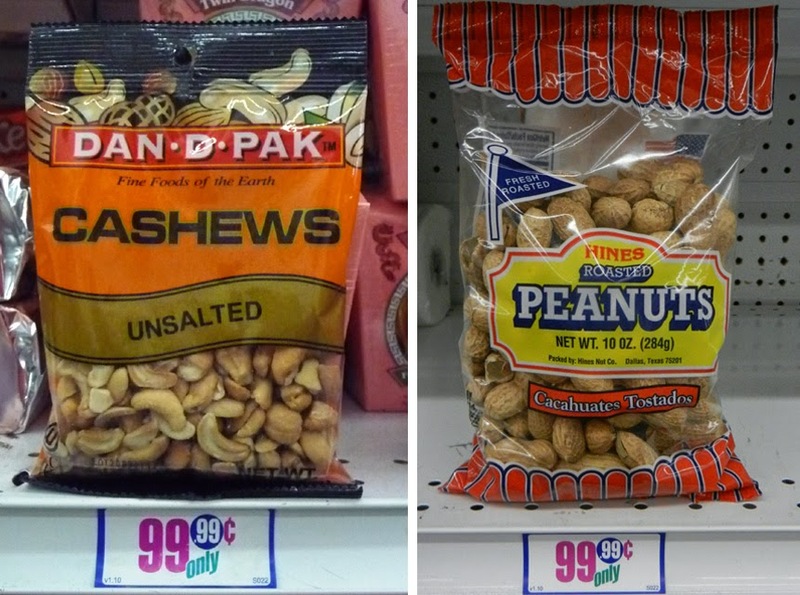 Substitute regular roasted peanuts instead of more expensive cashew nuts. You can taste the difference when fresh made, but after a day, or so, the curry flavor takes over and any nuts will taste the same. 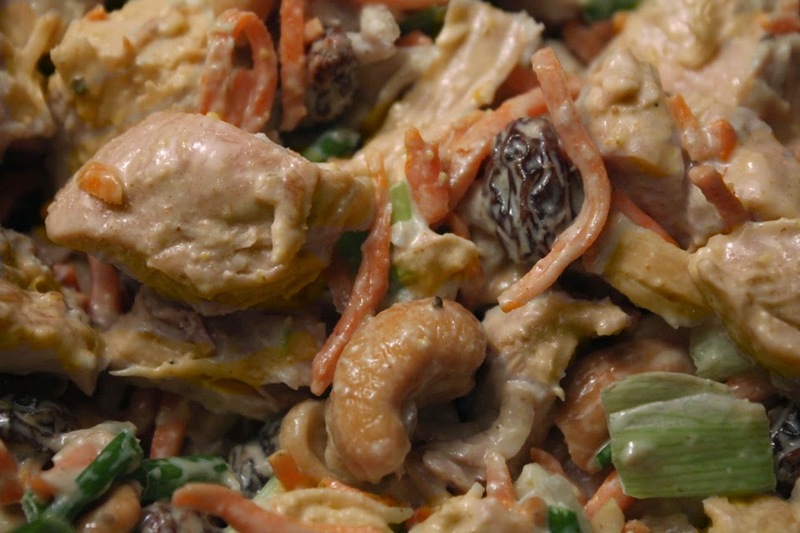 I've made Trader Joe's Curried White Chicken Deli Salad with dark meat. 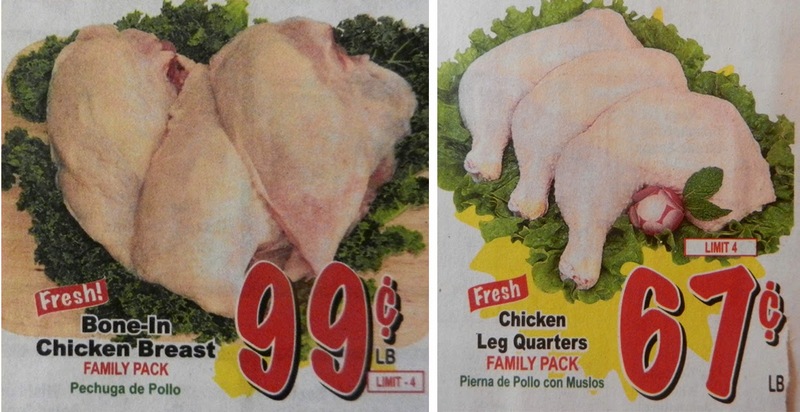 There recently was a great sale at my Latin grocery store for skinless and boneless leg quarters (thigh and leg combined) for 88 cents per pound! While white meat is more common in chicken salads, I like dark meat, as it's more moist than white meat. You can poach a leg quarter and chop it for this salad. 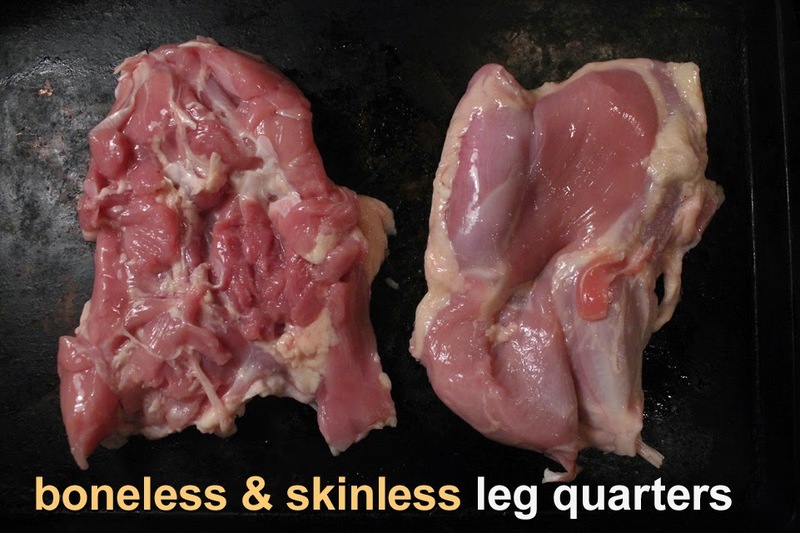 Dark meat has more fat that you can easily remove if necessary. This recipe is easy to double the ingredient amounts. Although, you may not want to exactly double the mayo, mustard and cumin (curry powder,) just add a little more at a time and taste. I was in Trader Joes yesterday and intended to buy some Curried Chicken salad but put it back when I saw the price---$7.99 for a very small tub. I can make 8 times that for the price. In a pinch I'd pay that amount though. Good recommendation, to buy curry powder at an Indian grocery. It is much less expensive. A word of caution on the tumeric. While it seems to have little flavor if you taste a pinch, too much can be quite bitter and ruin a recipe, at least that is how my taste buds perceive it. 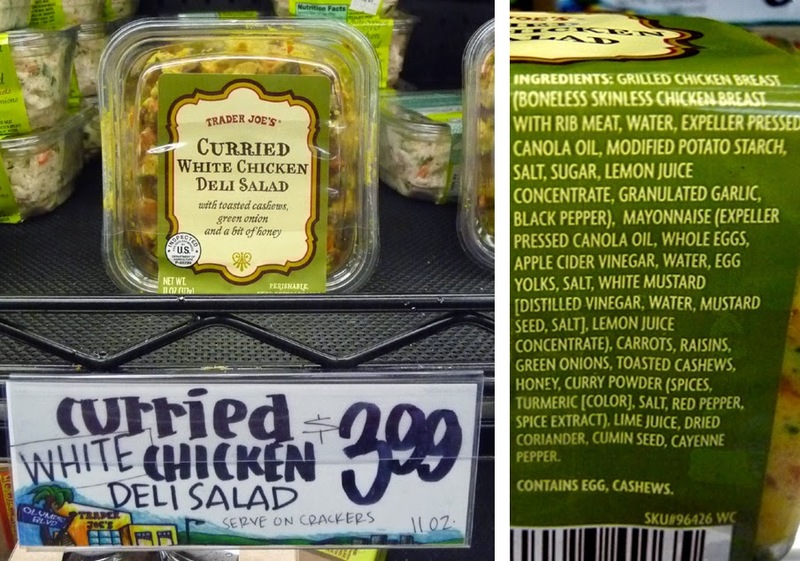 If you have an Earth Fare in your area, they too make a very good curried chicken salad. And the chicken they use is organic as well. The main difference between TJ's recipe and my own is the carrots vs apples. I like the idea of using carrots, so will give it a test run. 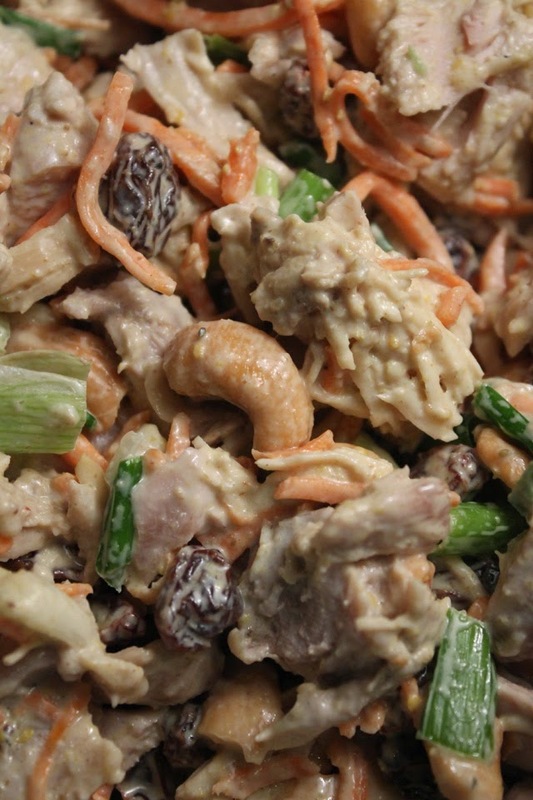 I was thinking, in a pinch a person could buy a bit of ready made chicken salad and some carrot raisin salad from the deli, combine it at home, throwing in some nuts and curry powder. I'm glad to hear your wife hides food to keep you from eating it---I do the same since I wised up and realized that if my husband sees it, wants it, he's going to eat it and too bad for me. Too bad for him now---LOL. We women must be wise as serpents, harmless as doves. Noted changes: I used agave and white raisins. I'll try apples the next time. This was delicious! I used curry powder and turmeric and it tastes and looks just like TJ's! I LOVE this recipe, and double it for our large family. I only add enough mayo to taste (less fattening), and use TJ's orange cranberries instead of raisins to give it a tangy sweetness. When finished, it really does taste better after the flavors "mingle" in the fridge for several hours. Thank you SO much for this wonderful, affordable recipe!